Ronald Wilson Reagan was born on February 6, 1911. He grew up to be a radio, film and television actor; he then went on to become the 33rd Governor of California, and the 40th President of the United States. Ronald Reagan was the oldest U.S. President when he took office, and he was also one of the most influential presidents in American history. He served two terms from January 20, 1981 – January 20, 1989. Reagan’s effectiveness as a public speaker earned him the nickname, “The Great Communicator.” Many of Reagan’s quotes and one-liners became instantly famous. American President: Ronald Reagan – This biography of President Ronald Reagan from the Miller Center at the University of Virginia includes Facts at a Glance, Selected Reagan Speeches, Essays on Ronald Reagan and His Administration, Reagan Oral Histories, a Reagan Multimedia Gallery, and Presentations About Reagan. Ronald Reagan Foundation – The Ronald Reagan Presidential Library and Museum is located in Simi Valley, California. Take a virtual tour, download civics curriculum, or search for social studies lessons. Ronald Reagan Archives – Ronald Reagan research materials. Check out this list of quick reference material concerning Ronald Reagan, Mrs. Reagan, and the Reagan presidency. Ronald Reagan Resources on YouTube – A selection of videos featuring Ronald Reagan, from Eureka College Media. Before Ronald Reagan was a Hollywood film star, Governor of California, and President of the United States, he was a student at Eureka College. Ronald Reagan Leadership Collection – Throughout his career, Ronald Reagan maintained a lifelong relationship with Eureka College. He visited the campus many times as an alumnus, a trustee, an Honorary Doctor, a governor, and of course, as President of the United States. This relationship is documented in the many linear feet of college records, published materials, photos, and videos held by the Eureka College Archives. These collections are organized into three main groups: Textual Materials, Photographs and Media, and Museum Artifacts. The Ronald Reagan Legacy Project – A special project of Americans for Tax Reform looks to point you to resources that will be helpful in remembering and learning about Ronald Reagan; including: speeches, articles, and other organizations highlighting the Gipper’s life. Ronald Reagan on IMDb – Ronald Reagan biography and filmography. 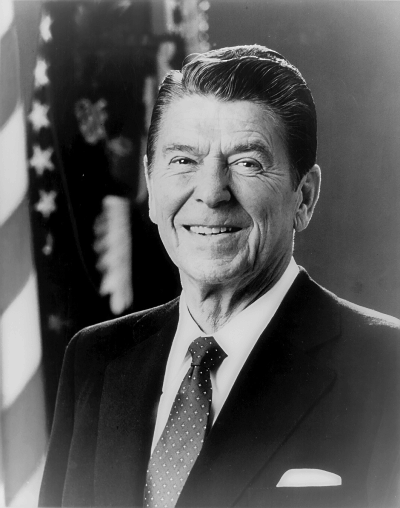 Reagan.com – A private conservative e-mail service for Ronald Reagan fans founded through the efforts of Michael Reagan, the son of former President Ronald Reagan and actress Jane Wyman. This entry was posted in 900 Geography & History and tagged american history, Reagan, US Presidents. Bookmark the permalink.